A supporter, foreground, of President Donald Trump yells as demonstrators chant outside Tom Bradley International Terminal during a protest, Jan. 30, 2017, at Los Angeles International Airport. Rafael Diaz-Yoserev is no huge fan of Donald Trump. The 69-year-old, who came to the United States from Cuba at age 13, may have voted for Trump but admits he often finds the president's demeanor offensive. "I still don't like him," says Diaz-Yoserev, who works as a surgeon in Miami, Florida. "But I'm in agreement with everything he's done so far." Diaz-Yoserev especially supports Trump's move to temporarily restrict immigration from seven Muslim-majority countries and suspend the refugee program. 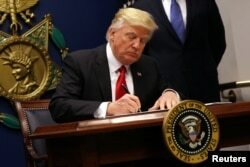 The executive order, signed late last month, set off days of protests across the U.S.
Last Friday, a U.S. District Court judge temporarily blocked Trump's executive order. Then on Sunday, the 9th U.S. Circuit Court of Appeals in San Francisco rejected the Trump administration's demand to reinstate the travel ban. The White House says the order is aimed at protecting the U.S. from foreigners who wish to do it harm. But opponents say it actually makes the country less safe because it is an unconstitutional and discriminatory policy that represents a first step toward fulfilling Trump's campaign pledge to ban Muslim immigration. Diaz-Yoserev doesn't see it that way. "I have nothing against immigration. I'm an immigrant myself," he says. "But if some foreigners are inconvenienced for the protection of the people of the United States, then it's obviously an acceptable trade-off." Polls suggest around half the country supports the ban, with opinion sharply divided along party lines. The latest poll, released Friday by CBS News, found that 45 percent of U.S. citizens approve of the travel ban, compared to 51 percent who disapprove. Supporters of President Donald Trump gather at Los Angeles International Airport during protests against Trump's executive order banning travel from seven Muslim-majority countries, Los Angeles, Calfornia, Jan. 29, 2017. A Reuters/Ipsos poll earlier this week showed 49 percent agreed with the measure, compared to 41 percent who disagreed. "I have absolutely no problem with the executive order," says Lisa May, a 52-year-old Trump supporter who runs an in-home day care in Kearney, Nebraska. May doesn't think the travel ban targets a specific religion, but expressed concern when asked about the idea of Muslim immigration to the U.S.
"If you want to come to this country and immigrate here, then do it legally and become an American and live by the American philosophy," she says. Some want the travel restrictions to go even further. Fifty-three percent of U.S. voters support "requiring immigrants from Muslim countries to register with the federal government," according to a Quinnipiac University poll from last month. Cuban-American supporters celebrate in the Little Havana area in Miami, as they watch a televised broadcast as President-elect Donald Trump is sworn in as the 45th president of the United States, Friday, Jan. 20, 2017. During the campaign, Trump suggested he was open to a so-called Muslim registry, though his staff has since tried to distance the president from those comments. Trump also called for a "total and complete shutdown of Muslims entering the United States," and made the proposal a top campaign theme for months before eventually backing away from the plan. At least several senior White House staff have also embraced anti-Islam views, including Trump's chief strategist Steve Bannon, who suggested just over a year ago that the U.S. is the "wrong place" for observant Muslims, and National Security Adviser Mike Flynn, who tweeted last year: "Fear of Muslims is RATIONAL." White House spokesman Sean Spicer this week said Trump doesn't share Bannon's views on Islam. And White House officials continue to insist that the travel ban isn't aimed at Muslims. Diaz-Yoserev, along with many others, agree with him. "This has nothing to do with religion," he says. "And if it means a minor inconvenience for some of the travelers to this country, then I'm sorry, but we have to protect our homeland." But polls suggest the public is skeptical that the travel ban will actually protect them. Only one in three Americans thinks the move will make the country safer from terrorism, according to the CBS News poll. 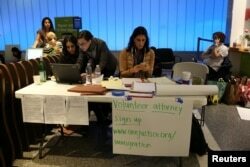 FILE - Volunteer immigration attorneys organize to help as people gather to protest against President Donald Trump's executive order travel ban at Los Angeles International Airport, Jan. 31, 2017. There are also questions about the legality of the executive order. Even if courts determine the move is legal and has widespread public support, that doesn't mean it's necessarily justified, warns Max Abrahms, who focuses on international security and public policy at Northeastern University. "We need to be careful about what the framers call the tyranny of the majority," Abrahms says. "We live not just in a democracy, but a liberal democracy. So we need to make sure that our laws represent not only the will of the people, but that we also protect minorities."